The Jut Art Museum is pleased to host the exhibition A Nonexistent Place scheduled to be on view from 8 April to 6 August 2017. Curated by Sean Hu, this exhibition features 11 artists par excellence from 6 countries, including Gregory Crewdson (U.S.A.), Leandro Erlich (Argentina), Rachel Maclean (U.K.), Shaun Gladwell (Australia), Takahiko Suzuki (Japan), Goang-Ming Yuan, Ya-Lun Tao, Kuang-Yu Tsui, Hui-Yu Su, Hsien-Yu Cheng and Chao-Hao Liao (Taiwan). Founded in late 2016, the JUT Art Museum presented its inaugural exhibition Home 2025 with “home” as the theme tune that had many resonances for the public and attracted over 30,000 visitors as a result. It not only provoked creative thoughts of “home in the future,” but also infused renewed cultural vitality into Taipei City. Distinct from Home 2025 that focused on a specific theme and real-life experiences, A Nonexistent Place returns to the mission that an art museum should pursue and the inspirations it should provide for the contemporary civilization. The 18 carefully selected tours de force collectively constitute a nonexistent place in the museum, a dream-like space underpinned by realities/fantasies, regularity/ exception, and irony/reflection. In this nonexistent place, the artists bear more than a passing resemblance to isolated islands manifested by their own artworks made from different sensibilities, perspectives and horizons in the rational world, setting the viewers out on an extraordinary spiritual journey into the unknown. We expect all the visitors to develop their own understanding or imagination of the world by admiring these ingeniously created artworks. “A nonexistent place” is a term inspired by Atlas of Remote Islands: Fifty Islands I Have Never Set Foot On and Never Will, a literary masterpiece by German writer Judith Schalansky. Born in East Germany in the 1980s when citizens were not allowed to leave the country, Schalansky was consumed with world atlas and used to imagine the life stories of the people living on the islands in different shapes and locations, which eventually contributed to the coming-out of this book. Curator Sean Hu believed that creatio ex nihilo is one of the arts’ mesmerizing qualities, and each creative process is an epic journey into the unknown that embodies the cycle of birth, aging, illness and demise; to wit, an inevitable fate written in the stars. The artists in this exhibition are dead ringers for the isolated islands on the map of human mind. They present chimerical and mysterious scenery of life to the visitors through their sui generis creative processes. By virtue of the exhibited artworks, the visitors to this exhibition may open their long-dormant inner eye and embark on a fantastic journey of soul searching across the spiritual space opened up by these artists. A Nonexistent Place features a total of 18 brilliant artworks that take diverse forms such as video, installation and graphics. Five of the participating artists used to represent the national pavilions or take part in the Central Pavilion of the Venice Biennale. This exhibition marks the debut of the installation Elevator Maze by Argentinian artist Leandro Erlich in Taiwan. Inviting the viewers to ride an elevator reaching no end, Erlich, as an artist relishing the interaction between his artworks and the viewers, plans to defy the public imagination and experience of spaces with the effect of optical illusion. Goang-Ming Yuan’s photographic works City Disqualified – Ximen District in Daytime and City Disqualified – Ximen District at Night explore the tremendous power of images by using computer software to repetitively execute the instructions of “cut” and “paste” as the way to remove all animate symbols in these images. Exemplifying a series of bizarre behavior in his video artworks An Imitation: Mimicry and Spring Action, Kuang-Yu Tsui attempts to intervene in urban spaces and investigate the relationships between human life and our living environment. The video artwork Skateboarders vs. Minimalism by Australian artist Shaun Gladwell illustrates the dynamic interaction between iconic minimalist sculptures and popular skateboarders who intervene in the museum’s space with superb performance of extreme sports, and thereby addresses the issues concerning contemporary subcultures and art history. Representing Scotland at the 57th Venice Biennale in 2017, Rachel Maclean exhibits her video artwork Please, Sir adapted from The Prince and the Pauper, a famous novel by American writer Mark Twain. The dozen of characters in this looping split-screen video are played by the artist herself, thus consciously embodying multifarious issues regarding media, symbols and stereotypes. In addition, renowned American photographer Gregory Crewdson infuses his work Untitled (Father) – Winter with discordant artificial elements, thereby transforming quotidian situations into the scenes that not only serve as the metaphorical expression of different emotional moments of human beings, but also depict the surreal scenery on the urban fringe. With his Betel Nut Kiosk Series, Japanese artist Takahiko Suzuki seeks to use the local, independent and unique small stores to reverse the relative values and positions of the center and the periphery as well as the mainstream and the alternatives in the globalized world. Ya-Lun Tao invites the viewers to travel through the dream-like space-time constructed by his in-situ installation In the Mirror/Out of the Mirror with the assistance of the VR headsets. Having just offered the thematic screening program at the invitation of the International Film Festival Rotterdam in 2017, Hui-Yu Su tries to share with the viewers the unique experience he underwent before the sleeping pills he took started to work, showing a psychedelic mixture of the influences of hypnotic drugs and the images on television in his video artwork Stilnox Home Video: The Midnight Hours. Hsien-Yu Cheng uses his artwork Sandbox to encourage the viewers to imagine a couple of absent artworks and contemplate the ubiquitous yet invisible monitoring network in modern life. By transforming the images of the pieces of outdoor hardware into indoor soft sculptures, Chao-Hao Liao’s artwork Armor Block gives the viewers a sense of discomfort and thereby prompts them to reflect on how human beings are related to the environment and spaces. Among the 18 pieces of riveting artworks in A Nonexistent Place, the exhibits by Leandro Erlich, Shaun Gladwell and Rachel Maclean are displayed for the first time in Taiwan. After the opening ceremony on 8 April 2017, Erlich physically presented to share his creative philosophy with the audience in the thematic talk delivered at the JUT corporate building where the JUT Art Museum is located. No sooner does Maclean complete the installation for the Venice Biennale in June 2017, than she will travel to Taiwan exclusively for the second thematic talk. Gladwell will also come to Taiwan to deliver a thematic talk in June. Meanwhile, a series of night talks will be given by the participating artists at the Eslite Bookstore, Dunnan Branch on 3 consecutive Saturdays starting from 20 May 2017. The non-stop, face-to-face talk with the artists par excellence from April to June renders this elaborately organized exhibition and its associated events highly anticipated! (All the associated events are free admission. 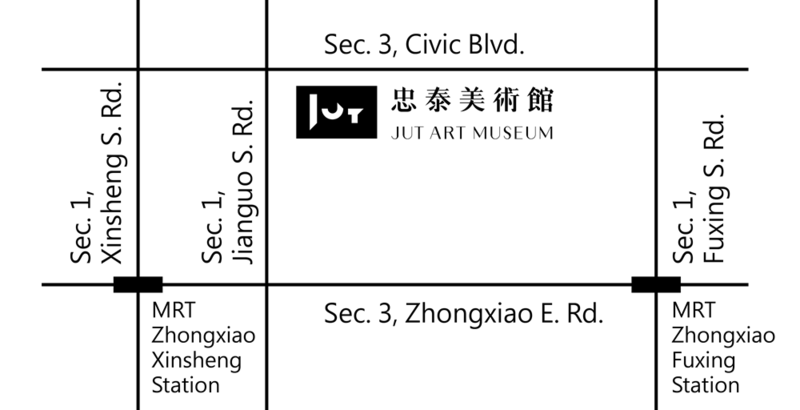 For information concerning registration, please visit the official website of the JUT Art Museum).